We grew a couple of bell pepper plants this year. Our whole family loves bell peppers! I was hoping to make this Garlic Roasted Bell Peppers recipe with bell peppers from our garden, but we had to pick them before they turned red. We have a short growing season, and the cold nights finally arrived last weekend. The rest of our tomatoes and peppers had to come off the plants green. That’s okay. We still love green bell peppers and it’s so easy to ripen green tomatoes. Fortunately, we’ve gotten an abundance of beautiful bell peppers from our CSA. Every week we get at least 4 locally grown, organic, delicious bell peppers. There are so many ways to enjoy bell peppers – in salads, dipped in hummus, in soup, stir fried and in Thai coconut. Roasted bell peppers are another wonderfully delicious way to enjoy them. You can serve roasted bell peppers as a simple side dish, on pizza, as a bread topper or in any dish that calls for bell peppers. 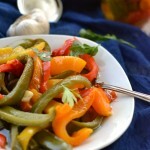 Roasted bell peppers are simple to make and delicious. 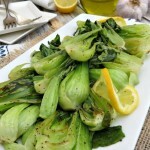 You can serve them as a side dish, on pizza, as a bread topper or in any dish with bell peppers. Place whole bell peppers on a large baking dish and add 1 cup of filtered water to the bottom of the pan. Slow roast the bell peppers in the oven for 30-45 minutes, or until tender. Remove bell peppers from the pan and place in a brown paper bag. Close the bag and allow it sit for 1 hour to loosen the skins. Remove skins from bell peppers and slice them into thin strips, removing seeds and stem. 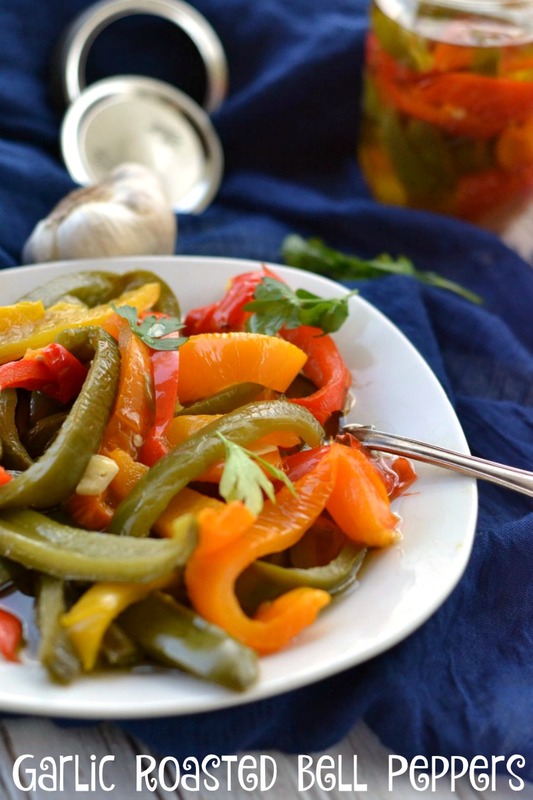 Place bell peppers an garlic in a large bowl with olive oil. You can store the roasted bell peppers in 6 large mason jars. Just add roasted bell peppers to mason jars with olive oil covering peppers. The roasted bell peppers taste better the longer they sit. What’s your favorite way to eat roasted bell peppers?